Cancer survivor Joe Murphy says that former NFL quarterback Peyton Manning saved his life after he witnessed his commercial. 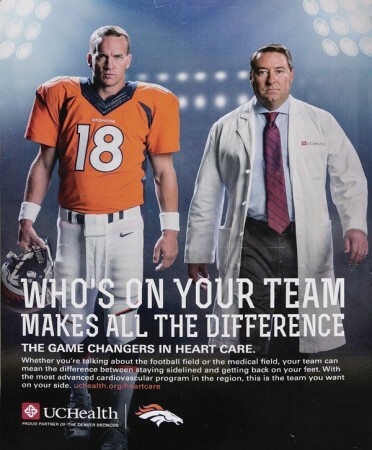 The commercial he is referring to is the UCHealth where Manning says “When you’re ready to be your best, you don’t just play the game, you change it.”. It’s about getting medical help for those in need. Murphy suffers from sarcoma, a rare cancer and he was just told there was no treatment. He decided to call UCHealth and they removed his right lung and six pound tumor once discovered by Dr. Victor Villalobos, Medial Oncologist and Director of Sarcoma at the University of Colorado Hospital. Villalobos says he is not cured as it’s more about buying time with treatments he was told were not available before. “Peyton Manning, thank you very much. You saved my life” said Murphy with the CBS Denver. NFL | 3rd Grader Not Allowed To Wear Broncos Manning Jersey Due To Gang #?